The holidays are a time for reflection. We look back on our resolutions, adventures, and accomplishments. We take a moment from the hustle and bustle of year-end obligations and think on where we are heading in the new year. This past December I was able to attend South Central SALT in Dallas, Texas. Over two thousand people gathered together to learn, be equipped, and spread the message of the Gospel. What a wondrous weekend! I enjoyed the powerful speakers, relevant seminars, and the always exciting Senior Luncheon. 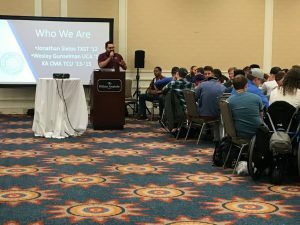 The National Chi Alpha Alumni Association has been increasing our presence at the regional SALTs around the country as we seek to bolster our network of ambassadors and connect with seniors and graduates. While we planned for around 200 students, the room was overflowing with interested students and recent grads. Wesley Gunselman, an active and excited alumnus by way of Central Arkansas and the CMA program at Texas Christian University, gave a rousing challenge to all the young adults who were considering their next step in life. He extolled the virtue of living out a Christ-centered life in the workforce. “You want to be a missionary? Get a job.” Wesley compared the missions we support in Chi Alpha with the mission we embark on every day. I am blessed by the willingness of Chi Alpha Alumni to give back to their communities and churches, and as we continue to grow more opportunities arise to give back to their Chi Alpha family. We are always seeking alumni willing to be an Ambassador for the Alumni Association. If you are interested in helping former Chi Alpha students Connect, Pray, and Give to the mission of Chi Alpha, feel free to reach out to us. Most encouraging this year are the partners who are coming alongside us to support our vision. Chi Alpha Alumni make great leaders, employees, spouses, and servants. The culture we learn in campus ministry is carried with us into our community. I encourage each and every one of you to keep up with our Facebook group and our website. If you have friends who were a part of our Chi Alpha family, we’d love to connect with them! I can’t wait to see where God leads this organization in 2019, and I’ll be updating you all each step of the way.